Patrick Todd has been a lifelong student of the American Civil War. 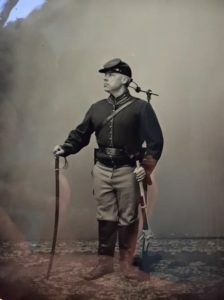 Having several ancestors who fought for both the Union and Confederacy, Pat grew up hearing many tales of battles and heroism passed down through his family. Combining his passions for the Civil War, and for photography, he began studying the vast amounts of images produced during this turbulent period. Combing over these iconic photographs was not enough, so Pat taught himself the wet plate collodion process, which was used to make the majority of these images. Now working for the National Park Service at Antietam National Battlefield, Pat can be seen carrying his large cameras and equipment following in the shadows of those who fought and died on these Western Maryland fields. On Wednesday, June 29th Pat will present his Summer Lecture Series talk “The Terrible Reality: Photographing Antietam”. Pat will explain how early photography changed the way people viewed not only the world around them, but the face of war itself. Primarily discussing the images made by Alexander Gardner on the fields surrounding Sharpsburg, Pat will also demonstrate how the wet plate collodion process was, and continues to be, done using period tools and techniques.